For black communities in the United States, presidential election participation rates are strong and momentum is building. In 2012, black voters showed up at the polls in the largest numbers (66.2 percent) and voted at a higher rate than non-Hispanic whites (64.1 percent) for the first time since rates were published by the U.S. Census Bureau in 1996. Black Americans tend to vote Democratic in presidential elections. This was true by historic margins in President Barack Obama's 2008 and 2012 victories — 95 and 93 percent, respectively. And their turnout rate in 2016 could be an important factor in deciding the next president of the United States, especially in a tight race. That's good news for black community leaders who want to ensure their voices are heard and hold future leaders accountable. The 2014 and 2015 cases of deadly police force against unarmed African-Americans have galvanized a tech-savvy generation of activists to inject new life in an age-old push for racial, economic and social equality. More and more, movements such as Black Lives Matter are becoming international household names and are holding candidates accountable to specifically address and push for legislation on these issues. One such organization, Black Alliance for Just Immigration (BAJI), engages and advocates on behalf of African-American and black immigrant communities on issues of racial justice and immigrant rights. BAJI's policy and legal manager, Carl Lipscombe, says part of the greater push nationwide to organize and bring to light instances of police brutality results from what he describes as a community-wide fear of "being killed when walking to the corner." He says these police cases are enhanced by the advent of social media and by the ability to capture events on camera that wasn't possible in the 1980s. FILE - Mara Jacqueline Willaford of Black Lives Matter holds her fist overhead as Democratic presidential candidate Sen. Bernie Sanders, I-Vt., greets the crowd in downtown Seattle, Washington, Aug. 8, 2015. Black Americans tend to vote Democratic in presidential elections. Lipscombe says candidates must do more than "throw a bone" if they expect communities of color to go to the polls in droves. "It's not enough to just say we want free education for everyone," Lipscombe said. "We want to know how this is going to impact black people." According to the U.S. Bureau of Labor Statistics, the unemployment rate among blacks in the United States, at 9.4 percent, remains significantly higher — nearly double — than the overall rate of 5 percent nationwide. Black wealth also has declined. The non-partisan Economic Policy Institute, in coordination with the liberal research institution Center for Popular Democracy, reports that black workers' wages have fallen by 44 cents on the hour in the past 15 years, while wages of both Hispanic and white workers have increased by approximately the same amount. The Migration Policy Institute reports that black immigrants from Africa are better educated than the overall U.S. population, age 25 and older. In 2007, 38 percent held a four-year degree or more, compared to 27 percent of the U.S. population. Yet, black immigrants earn lower wages and hold the highest unemployment rate in comparison to other immigrant groups, according to the Center for American Progress. Bakary Tandia, case manager and policy advocate at African Services Committee, a Harlem-based agency dedicated to assisting African immigrants, refugees and asylees, says progress is necessary across all levels of government. "Even if you take the case of [New York City Mayor Bill] de Blasio,” Tandia said, “he is a progressive mayor, but in his administration, I have not seen any African immigrant appointed or in a meaningful position, and the same thing goes at the state level, at the federal level." FILE - Democratic presidential candidate Hillary Clinton speaks during a campaign event at Clark Atlanta University, Oct. 30, 2015, in Atlanta, Georgia. Grass-roots coordinators say anti-immigration rhetoric among some presidential candidates has fueled electoral participation, as well as greater community leadership. Steve McFarland, whose organizing efforts include get-out-the-vote campaigns among disenfranchised communities in New York, says the immigration reform movement, combined with the work of Black Lives Matter, has produced a new generation of civil rights leaders. "It doesn't look the way that it used to look," McFarland said. "It's not big organizations, but they can mobilize people, they have a clear voice, and they are winning changes across the country." Ahead of the 2016 presidential primaries, there is good news for Democratic frontrunner and former secretary of state Hillary Clinton. She currently enjoys an 80 percent favorability rating among adult blacks, the highest positive net rating of all candidates, according to a recent Gallup poll. 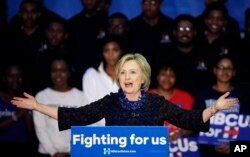 Clinton, who has met privately with Black Lives Matters activists, specifically addressed racial profiling in an October speech at Clark Atlanta University. "Race still plays a significant role in determining who gets ahead in America and who gets left behind," Clinton said. "Racial profiling is wrong, demanding, doesn't keep us safe or help solve crimes. It's time to put that practice behind us."